Ludum Dare 30 took place this past weekend, August 22nd-25th, 2014. The theme was “Connected Worlds.” I participated in the 72 hour game jam and made a game called Planetary Devourers. I’ve participated in Ludum Dare before. Click here to see all my posts about Ludum Dare. 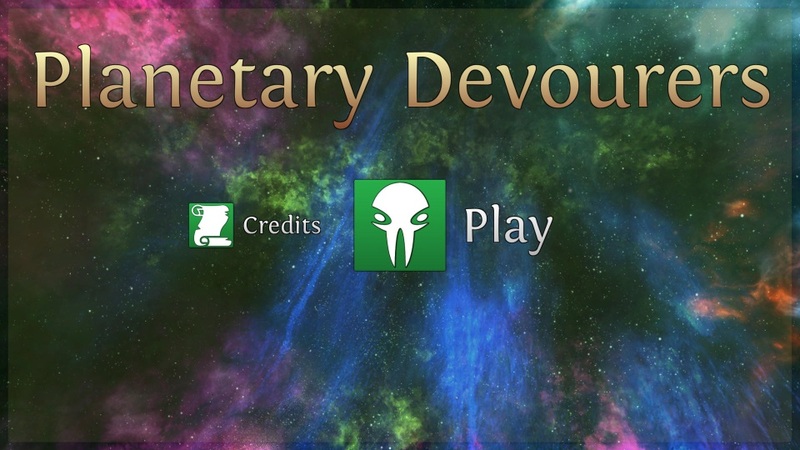 LD30 – Planetary Devourers can be considered a puzzle game in which you have to navigate an all-consuming swarm from planet to planet in order to reach a warpgate to another solar system. The swarm consumes the planets it occupies, destroying them once they are completely consumed. This can cause the swarm to get stranded in space, sentencing it to doom with no way to escape. More information about the game itself can be found on the official LD30 – Planetary Devourers game page. Also, if rating is still open (until September 15th, 2014) please view, play, and rate my game on the LD30 website. Oh yeah. Those worlds are definitely connected. I was pretty sure this would be the theme even before it was officially announced. Even so, I was having a hard time trying to think of an idea that corresponded well with the theme. Somewhere in the midst of spending several minutes of trying to come up with ideas on my own, I turned to K and told her what the theme was, since I thought she’d be interested to know what I would be spending the next 72 hours focusing on. She took that as a request for her help with brainstorming ideas and immediately dropped what she was doing so that we could bounce ideas off one another. She’s awesome like that. Though I hadn’t intended it as a request for help, it did turn out to be very helpful; the game I made was based almost entirely off of one of her suggestions. The idea was simple: You have to cross the solar system to get to a warp gate which would take you to a new solar system. Planets would be different sizes, indicating how many times you could visit them before they were destroyed. 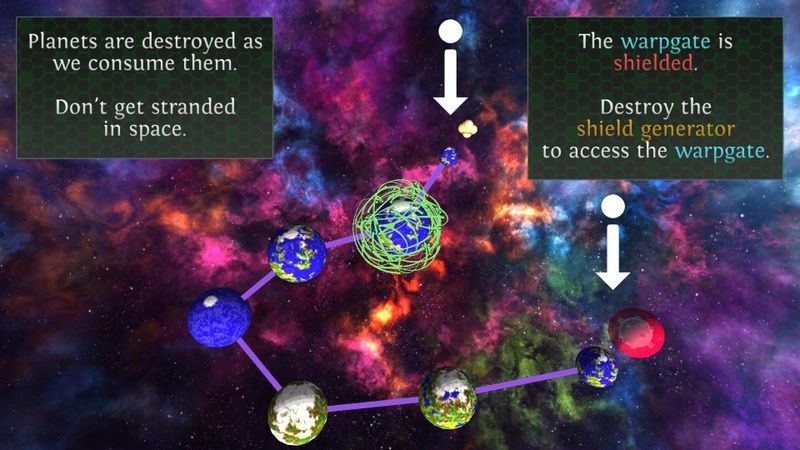 In order to keep the player from just going straight to the warpgate, we introduced the idea of shield generators which would keep you from using the warpgate until they were all destroyed. 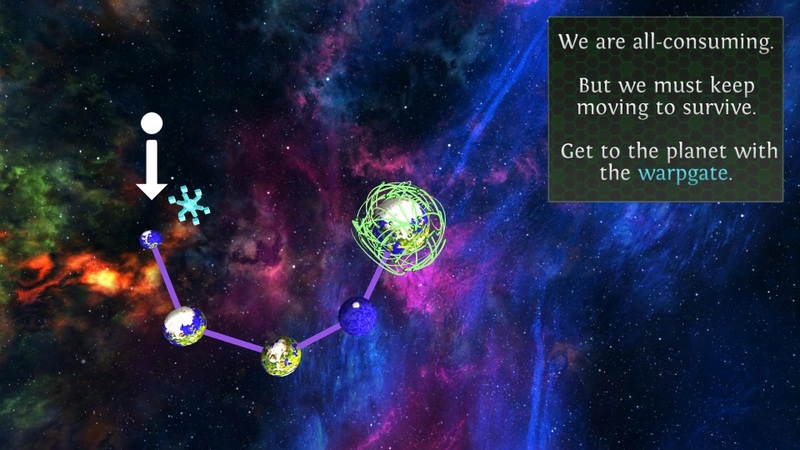 Thus, you had to carefully plan your route to the shield generators and back to the warpgate to keep from destroying a connected world which was the only path to the exit. With that in mind, I set to work. I took a screenshot of my monitor (at 2560×1440 resolution) every two seconds while working on the game. This resulted in 46,605 screenshots for a combined total of 50GB! I then compiled all of those screenshots into a video at 30 frames per second. Therefore, each second of video is equal to about a minute of real-time. That means that this video shows nearly 26 hours of work, including the time I took to package up the game and submit it to Ludum Dare. There were 2539 games in total submitted for Ludum Dare 30. You can easily browse, play, and rate them on Itch.io. It was a pretty good event for me this time. I successfully created a game from scratch within 72 hours. Go me! You can view it, play it, and rate it on the Ludum Dare website if you’d like. Introducing warpgates in the first level. Pretty much everything. I was really surprised at how smooth the whole experience was for me this time. The idea was simple enough that it could reasonably be done by the deadline, given my skillset. I didn’t feel rushed for time. I felt like I was well ahead of schedule to get the game where I wanted it by the deadline. In fact, I had so much “extra time” near the end that I decided to add a couple more levels. This was a time-consuming process, but ultimately it was worth it, as the game is pretty short. I’m pleased with how the shield generators and warpgates turned out. I’m no artist, so I just used some basic shapes and combined them in interesting ways that I feel looked decent. I feel like I did a good job introducing concepts one at a time, ramping up the difficulty. It’s actually impossible to lose the first level! And you’d have to try to lose the second level. Introducing shield generators in the second level. The problem with it being a puzzle game is that I couldn’t judge how hard or easy or fun it was. Since I was designing the puzzles, I already knew all the solutions, so it seemed a little boring and easy to me. I probably should have gotten a couple of people to play it while I was working on it to see their reaction to help me judge the difficulty of the game. Though from the feedback I’ve received thus far, it seems even other players can’t agree on the difficulty, with some saying the difficulty curve was just right to others saying they got tired of losing so much and didn’t finish it. I probably should have taken the time to make it easier on myself to make levels. It was a very time consuming process manually placing each planet and then manually linking each planet to the surrounding ones, and then manually linking those ones back to it. 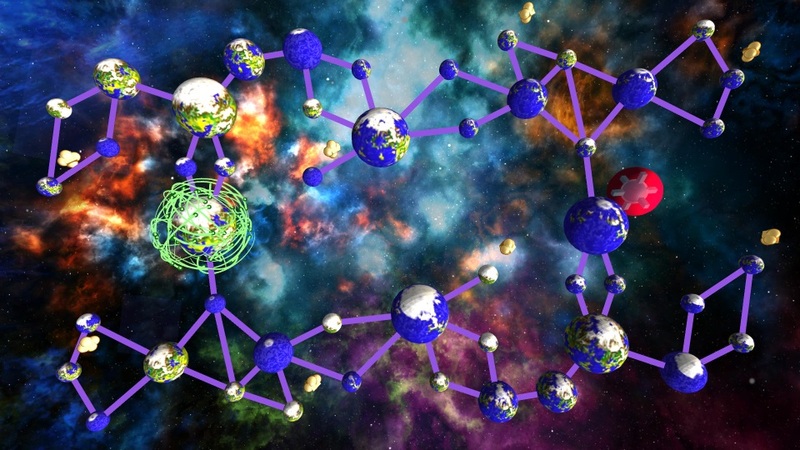 I could have saved myself quite a bit of time and trouble if I had just made the each planet automatically link back to any planet that was linking to it. I think the sound effects are the weakest part of the game. I have a huge library of sound effects I could have turned to in an effort to make it sound nice, but for some reason I felt like I should try to make as much of the game assets myself (more in spirit with the 48 hour challenge). This was not a logical decision, especially when I turned to other assets for the space/planet images and the music. I felt like I really floundered for a while and wasted a lot of time trying to figure out how to use NGUI to make the menu. This was especially frustrating for me because I was livestreaming development and I felt like anyone who was watching must have been bored out of their minds watching me struggle for half an hour trying to get a texture to appear the way I wanted it. I should have practiced with it more before Ludum Dare started. The good news is that eventually I got the hang of it and was able to make some good progress, and I’m fairly pleased with the results. The biggest complaint from others thus far seems to be that if you mess up and get a game over, you have to start from the beginning. I did put a cheat code in the game to reload the current level but it seems I should have put in a level selection screen or just restarted the same level when failing it. As with my Ludum Dare 29 entry, I’m not entirely happy with the name of the game. As a placeholder title, I used “Intergalactic Infestation of Deadly Doom” but at the last minute I changed it to Planetary Devourers because I just couldn’t think of a good title for it. Oh well. While it may seem from these bullet points that there were more things that didn’t go well than did, that’s only because it seemed like almost everything went very well, and I felt it would be redundant and boring to have a bunch of bullet points saying so. The title screen for my LD30 entry. I made a new game over the weekend. (Don’t forget to view/play/rate it here.) I really enjoy the feeling of accomplishment and the realization of my abilities and growth. It is true that I also get a sense of the areas where I lack skill and need to improve. But for some reason I still tend to consider myself a noob, yet coming away from Ludum Dare 30 with a successful, complete game makes me realize that I’m not quite so bad at it after all. Once again, I appreciate and am extremely grateful for the support and encouragement of friends and family, whose understanding and undemanding nature over the weekend while I devoted almost every spare moment to Planetary Devourers were greatly enabling to me. Thank you!